San Miguel de Allende is nothing if not Instragrammable. With its rich colors, its colonial architecture and cobblestoned streets, its traditional crafts and its beautiful people, San Miguel will have your camera screaming to be clicked. Here’s why–15 of the most commonly photographed places and things in San Miguel de Allende. One of the rules of living in or visiting San Miguel de Allende in the central Mexican highlands: Never leave home without your camera! There are so many beautiful, odd, or off-beat things in San Miguel de Allende, pictures screaming to be taken everywhere you look. Whether you like the long-shot panorama of the streets and the view with purple jacaranda trees or you prefer to focus on the more intimate details of a dancer or your dinner, San Miguel is a feast for your lens. Don’t believe it? Just put #SanMigueldeAllende into the search box on Instagram and see what you get. This town is an instagrammers banquet. Take a look at this list of 15 of the Most Instragram-worthy photo spots and things in San Miguel de Allende. * To see more wonderful photos of San Miguel de Allende, click on the Instagram images embedded below and check out the feeds of the photographers–including mine. Likes and comments ar always welcome there. #15 – The Old Gas Pump: Was This the First Gas Station in San Miguel? This old pump is found at the corner of Juarez and Mesones. I have no idea how long it has been there, but I’ve seen it in some very old photos, from the ’30s or ’40s. Until a couple of years ago, it tilted at a bit of an angle. Then one day it disappeared. There was a public outcry–“Where have you taken our beloved old gas pump? Bring it back!” But no worries, it had merely been removed to repair the base. It now sits proudly upright once again, just waiting for your camera. One of the best vintage things in San Miguel de Allende. You thought the original VW Beetle was a relic of the past? Not in Mexico, it’s not. In fact, Mexico was one of the very last countries in the world to still manufacture the iconic little car, and they can still be seen frequently on the streets of San Miguel. They are as beloved by Mexicans as they are in many other parts of the world. They even earned that ultimate sign of affection from Mexicans, a nickname. They are called vochos, though I have never been able to find out why. Perhaps for the “V” in VW. On July 30, 2003, the last vocho rolled off the assembly line in Puebla, Mexico, accompanied by a Mariachi singing the song “Las Golondrinas” (a Mexican folk song that speaks of farewell). It was immediately shipped off to become a permanent fixture at the Volkswagen Museum in Wolfsburg, Germany. So keep your eye open for photographable examples of this most Mexican of things in San Miguel de Allende. These Otomi Women craft lovely hand-made dolls with embroidered features and sell them in the streets and doorways of San Miguel. The Otomi people are an indigenous group that goes back centuries in this part of central Mexico. In fact, the nearby pyramid at Cañada de la Virgen, which dates back at least 900 years, was built by the Otomi. Thousands of their direct descendants live in the pueblos and ranchos around San Miguel de Allende. There are many public fountains remaining around San Miguel, and several are quite lovely. But this one behind the Parroquia church, on Cuadrante Street, just uphill from Cuna de Allende, is surely the most photographed. It’s easy to see why. The carving, the colors and the bougainvillea are all lovely and tell a story of San Miguel’s colonial past. It is one of the prettiest things in San Miguel de Allende. Not simply your typical enclosed botanical garden, El Charco del Ingenio, covers more than 170 acres on the southeast edge of San Miguel de Allende. It is one of my favorite spots in town to get away from noise, traffic, buildings and people. The name comes from a legendary spring-fed pool deep in the canyon. It includes a reservoir with a dam you can walk across, wetlands, scrubland, hundreds of species of cacti and succulents, many of them endangered, plus birds, flowers and indigenous trees. It was created to preserve and protect the biodiversity of this beautiful area. In 2004, El Charco was declared a Peace Zone by the Dalai Lama. The neighborhood of Guadalupe, not far from the Fabrica Aurora Art & Design Center, has been officially designated an Arts District. This is thanks to the Muros en Blanco project begun a few years ago by Colleen Sorenson. Over the years, she has brought dozens of street and graffiti artists from all over Mexico and the world to adorn the blank walls of Colonia Guadalupe with fantastic murals. The street art of Guadalupe is definitely one of those things in San Miguel de Allende that make it worth a trip, camera in hand. The Mojigangas (pronounced Mo-hee-gahn-guhs) are one of my favorite San Miguel traditions. These giant figures with wooden A-frame bodies and over-sized papier maché heads, are part of just about every wedding, festival, and procession in San Miguel. At 15 feet tall, they tower over everyone else. The puppeteer climbs inside the A-frame, hidden by the figure’s fanciful clothes, and carries it on his shouders as he dances through the streets. A small slit or window about waist high allows him to see where he’s going. Frida Kahlo and Diego Rivera, as part of their celebration of Mexican culture, had a pair of mojigangas in their home in Mexico City. You will almost never read a travel article about San Miguel that doesn’t mention the colors. They are everywhere. From the rich earth tones of the houses in El Centro, to the cobalt blue or lime green, mauve or pink or lemon yellow of the facades once out of the center. These colors glow in the handicrafts on sale everywhere, in the bright rebozos (shawls) and flowered garments of the indigenous women, in the fluttering “papel picado” flags that flutter on the streets for every festival, in the paintings of the artists who flock to San Miguel for the special quality of the light. Visitors’ cameras itch to capture those colors. If you grew up on what you thought was Mexican food, in Calilfornia or Texas or most anywhere outside of actual Mexico, you have a delectable surprise in store when you order your first truly authentic Mexican meal. The food is varied, hearty, and amazingly delicious. San Miguel now has a food scene that can rival any other town of its size in the world, and many much larger ones. From street tacos to haute cuisine, enchiladas to fusion, the San Miguel food scene’s got it. I fell in love with San Miguel de Allende more than 25 years ago… at first sight. As my bus into town drove slowly past the Mirador, a viewpoint from the periferico road that curves above the town, San Miguel landed in my heart. When I returned a few years ago to live in San Miguel after a multi-year absence, I stopped again at that very viewpoint to drink in the panorama and let myself know I was back home at last. There’s another great viewpoint on the Salida a Querétaro. That view is one of the things in San Miguel de Allende that people have been photographing for years. Isn’t it gorgeous? What is it about doors that appeal to so many of us photographers? I can’t say, exactly, but I know I often find myself framing a beautiful door in San Miguel. So do many others. They are among the many things in San Miguel de Allende that just beg to be photographed. Of all the dozens of festivals, street parties, fireworks and religious processions that happen throughout the year in San Miguel, my very favorite is Día de la Conquista, Day of Our Lord of the Conquest, which happens the first Friday in March. Because that’s the day the conchero dancers fill the town. The spectacle of drumming and dancing in front of the Parroquia is unforgettable. Even more wonderful, for me, is that this is not a show put on for the tourists, although they will certainly be crowding around watching and taking pictures of the gorgeously clad and beplumed dancers. This is a religious rite that is very important to and for themselves. It combines their pride in their indigenous heritage with their love of their mestizo race, celebrating the meeting of the Old and New Worlds. It is not to be missed if you are in town. See this post about why the conchero dancers have a special meaning for me. A very popular Instagram shot is any of the wonderful streetscapes of San Miguel. With their cobblestoned surfaces, the colorful facades, and the hills climbing up and down through town, the calles offer photographers a whole cornucopia of material for their lenses. It’s one of the things in San Miguel de Allende you are sure to find yourself trying to capture during a visit here. And speaking of street views, this one is one of the most photographed things in San Miguel de Allende. This is Calle Aldama, heading toward the Jardín, with that wonderful view of the Parroquia church at the end. I think most visitors to San Miguel end up taking one of more shots of this street. 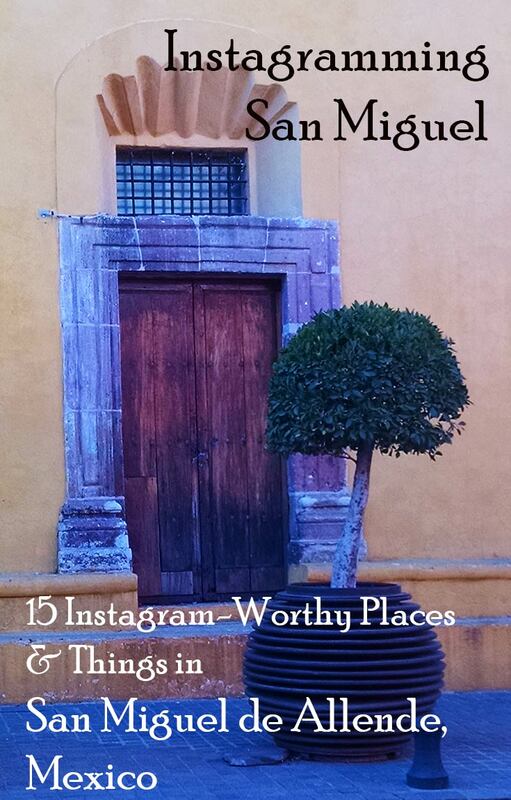 There is no question about what is the #1 most Instagrammed thing in San Miguel de Allende. The Parroquia church, which anchors and adorns the Jardín Principál, the town’s main plaza, is an unmistakable icon. You can be pretty sure that every visitor to town will take at least one photo of it, with or without themselves standing in front it. The church interior is very old, but the facade dates back only to the 1880s. A local stonemason named Zeferino Gutierrez designed it based on postcards he’d seen of the great Gothic cathedrals of Europe. When I was in Barcelona a couple of years ago, I was truck by the similarity in lines to the Cathedral of Barcelona. And by the way, please don’t call our beautiful church a cathedral. It’s not, since it has no bishop. It is “simply” a parish church, albeit a magnificent one. Now, doesn’t that make you want to get yourself down to Mexico with camera in hand and photograph all the wonderful places and things in San Miguel de Allende? To put on Instagram or not, up to you. But it’s so much fun to share this glorious town with others, especially those who think Mexico is all beach resorts or cantinas. 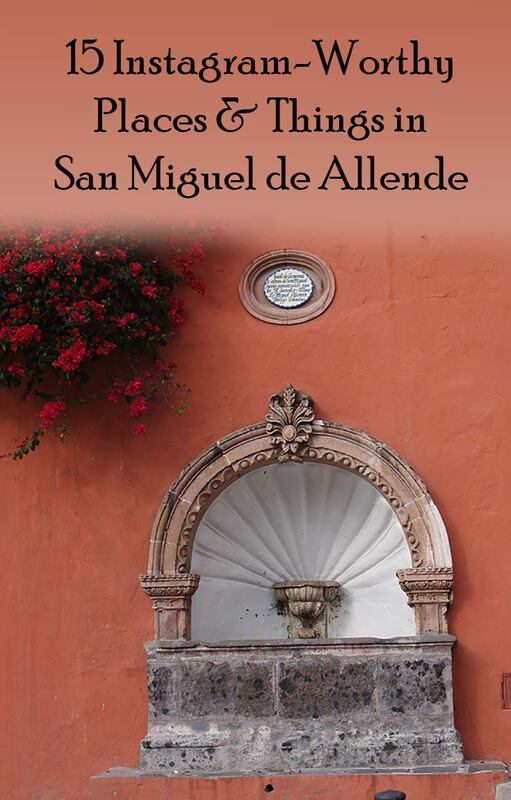 Come see San Miguel de Allende… and bring your camera! If you are planning a trip to San Miguel or elsewhere in Mexico, check out this post all about the budget airlines of Mexico. Why pay more? Donna! You captured San Miguel’s beautify, colors, culture. I love your photos and they make me miss San Miguel so much. You are truly an artist. Thanks so much, Sandra. You are always so kind. Not all the photos are mine. Many are from other Instagram accounts. If you click on the photo, it will take you to their IG account. What is amazing to me is how much has not changed since I lived in San Miguel de Allende for a year, 1963-4. I had my 10th birthday there. Our photos back then were slides and my parents took many of the same scenes that are featured here. There was no botanical garden then and no modern art street murals, but everything else is very familiar to me—53 years (gulp!) later. When I visited for the first time again in 2012, I could still find my way places. This photo essay is making me want to return. Thank you, Suzanne. It’s good for me to hear that these things have not changed. San Miguel has grown so much… it is more than twice the size it was when I first moved here in 1990. But the spirit is the same. The essence doesn’t change. I’ll be happy to welcome you anytime, with or without Mr. Excitement. Donna.. where is that first photo from.. with the red arches?? Vicki – It is the roofline of the Colegio de Sales taken from the south side of the Plaza Civica. I took it a few years ago. I never looked to see if they have changed the colors. It’s one of my favorite SMA shots. I agree Anado, although this post was pretty specifically about that generic SMA, since I was looking for what visitors tend to photograph most often. But I also like getting below the surface. For instance, I’ll be writing about Rancho Agustin Gonzalez, where I spend time with Otomi friends. Those are the kinds of stories I love to do. Thanks for your comment. I love these photos of San Miguel de Allende. Everything (buildings, people, scenery) looks so vibrant and full of life. Agreed, Donna, and that’s what San Miguel IS–vibrant and full of life. Those photos are stunning. I would love to see all those bright colors and the doors in person. It looks like a very special place to visit. Thanks Lois. I hope you can make it down one day. We’ll have a cafe con leche. This was sure an enjoyable look-see. You’re right, San Miguel is definitely great for Instagram. I enjoyed the colors, the old buildings, and the incredibly tasty-looking food, too. Thanks, Tami. I’m glad you enjoyed it. San Miguel de Allende is a beautiful city which I plan to visit sometime next year. I also love all the old Volkswagens you see driving around Mexico. I learned about that fact when I visited Mexico City last year. How much time did you spend in San Miguel de Allende? Thanks for the commennt, Nate. When I visited Mexico City often in the 1990s, many of the taxis were “vochos” with the front passenger seat removed for luggage and packages. I loved that. And I actually live in San Miguel now. I have been here 14+ years total, 10 in the ’90s and now since 2013. 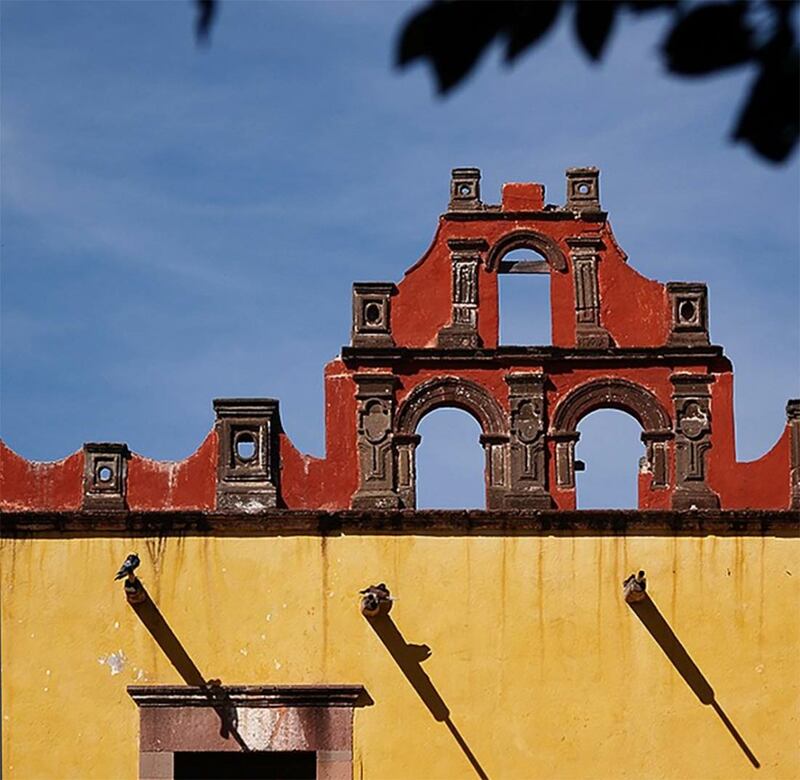 Beautiful photos of San Miguel de Allende. I have never been to this part of Mexico but it does have that classic Mexican vibe and style. The Mojigangas remind me of the Gigantes I’ve seen in parades in Spain. Thanks Rhonda. I’ve read that the Mexican mojigangas developed from the Spanish tradition of the Gigantes. So good call. Such a great idea showcasing where you live. These are some spectacular photos. My favorites were the rusted VW’s and the ladies in the traditional costume. So colorful and fun. Nice street art, too. Thanks, Melody. San Miguel is an easy place to photograph well. There are wonderfu and colorful pictures everywhere you look. Wow! San Miguel de Allende looks instagramable indeed. Everything is so colorful! It is that, Mags. Color everywhere. That’s Mexico for you! What a great collection of photos that display a variety of sides to SMA. I’ve heard great things about it and it’s nice to see it from a locals’ perspective. I’m looking forward to seeing it for myself later this year. Thank you, Vicki. I know you will enjoy San Miguel. I hope I’ll be in town when you do. Contact me! Beautiful photos. At first I was going to say I liked the Mojigangas. Those giant figures are so colourful. But then I saw the doors. So much colour in San Miguel de Allende. Now I know why you did a post on the Instagrammed photos! Thanks Janice. Yes, San Miguel is so photogenic, it’s easy to find wonderful pix. And I am an IG junkie, so it was a natural! Great Pictures. I lived in Mexico City for five years and traveled all over. Mexico is a great place to take colorful pictures. Some of your pictures remind me of places in Portugal. I hope to visit Mexico again soon. Thanks again for sharing. Thanks Carol. I agree that many paces in Mexico look like htey could be in Portugal. Or Spain. San Miguel de Allende seems like such a photogenic place! I’d really like to visit, so thanks for the tips! You will love it when you do visit, Catherine. Color everywhere. Have your camera ready! Thanks, Francesca. Yes, San Miguel has been in the news a lot lately, especially since Conde Nast named it the “Best Small City in the World” last year. And yes, SMA is all about color. Hi. I’m a Woodstock generation woman seeking compadres. Daughter died. Had enough of winter blues in UK. Dug out my old rucsack and heading for Mexico in February. A little wobbly about this spontaneous travel urge…but hey!…life is short! Not afraid of travelling…( once-upon-a-time travelled Tehran…Herat..Kandahar..Kabul in a VW). But uncertain about the loneliness of being an elderwoman in a hostel. Hi Fiona – Congratulations on your decision to hit the road again. I salute you. I’ve not stayed in any hostels in Mexico, I have stayed in many of them in various European cities. I’ve never really felt out of place as an older woman there. On the contrary, I felt welcomed and had many interesting conversations with other guests of all ages. I sometimes felt a slight sense of being seen as a curiosity, but after a brief conversation, that always dissipated. I say just go fo it! Is this the place in the movie Coco? I was just really curious because of the colorful flags and the vibe of the place. I love it already! I agree that it really is instagrammable. I would really love to go there right now! Hi Jake – It’s easy to see why you’d think Coco was set in San Miguel. Others have thought the same, and it might have been all or part of the inspiration. But those flags and vibe and architecture and color and Day of the Dead celebrations do show up in various places in Mexico. The whole country is kind of wonderful that way. Do come to San Miguel. It’s magical.